Chris E. Vargas, Video still from Liberaceón, 2011. 16 minutes, three channel video installation looped color (DV). History, like most things, is subjective. What is culled from individual accounts is accepted as fact and eventually translates into some kind of truth. But truth can be different at any moment—past, present, and future. 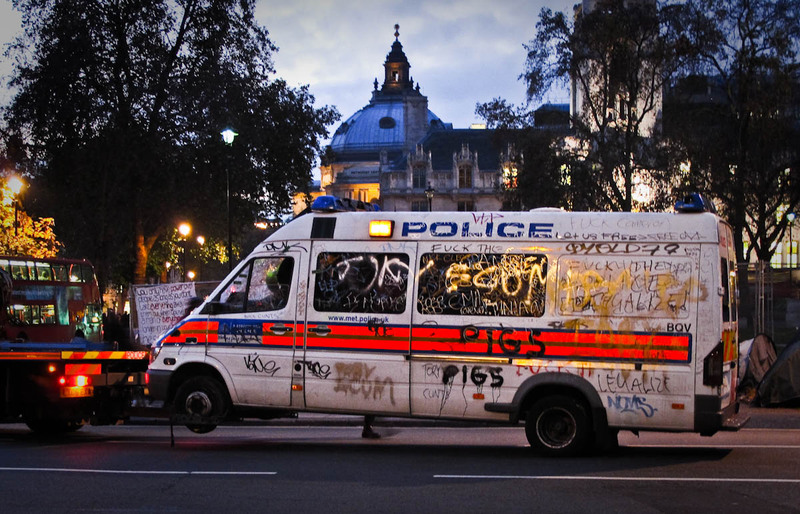 The events in London were either riots or long overdue, civil unrest. Depending on whom you ask, in 2005 the people of New Orleans were either looting or just surviving. This parsing of history renders “truth” and “fact” malleable, constituent materials for narrative and artistic practice. In his video work Liberaceón (2011), Bay Area artist Chris E. Vargas makes histories, meshing the life of the pianist Liberace, late-80s direct actions to end the AIDS crisis, and a nonapologetic use of green screening. Vargas is best known for his collaborative, narrative videos and films. In Falling in Love…with Chris and Greg (2008–ongoing), we watch the dark satire of Vargas and his artistic/romantic partner Greg Younmans’s relationship. Through the structural lens of traditional sitcom, the couple questions notions of monogamy, marriage, and gender, while consistently establishing their own, not always hyper-radical or “appropriate,” notions of companionship. Not unlike Falling in Love, in Liberaceón, Vargas inserts radical, queer rhetoric into the arguably apolitical, high zest that was Liberace. Liberaceón includes footage of the showman’s TV specials, Liberace’s nightly news obituary, and various ActUp protests beside Vargas’s molty wigs, camp, and classical, non-method forms of acting. True to Liberace’s mid-1980s opulence and Vegas styling, the video begins with Vargas-as-Liberace’s grand entrance, which includes a balloon ride over “the Strip,” a reclaimed parking lot with a sequined American flag and a Rolls Royce. The film quickly cuts to Liberace and lover Cary James’s visit to a doctor (Younmans), who has an unfortunate bedside manner and gives a dreadful—but at the time, not uncommon—diagnosis. Inspired to make James feel better, Liberace takes to preparing some chicken soup (again, epic use of chroma key by Vargas). While watching the news in his decadent kitchen, Liberace becomes frustrated by the many AIDS-related deaths, President Regan’s continued silence and the US Congress’s conservative funding of AIDS research. The performer decides to take direct action by constructing a gift with his “special ingredient…to scare ole Ronnie.” What follows is the most compelling and sensual use of a double boiler, all in an attempt to make a Liberace-laced, bloodied chocolate piano. The glittering stone on this work’s bejeweled finger is the deathbed scene between Liberace and James. Vargas’s slow collapse, full of gasping and eye-flickering, is at once hilarious and disquieting. One knows that Liberace’s many requests not to be memorialized with sap, nor to reduce his or others’ experiences to melodrama, but to honor the experience of any person with AIDS, including himself, have gone largely unanswered. Yet, as the work closes with Liberace’s rendition of “I’ll Be Seeing You” over the tense excitement of ActUp action footage—which includes his own disrupted, TV news obituary—one understands that these histories are strangely enmeshed, joined at the site of their presumed queerness or temporality by Vargas, where they transform one another. In Vargas’ telling, the closet Liberace comes out of is that of radical queerness. Although he calls himself “just an old queen,” Liberace’s anger speaks to the continued complexity of our histories and picturing of self. Liberaceón (2011) was on exhibition most recently in San Francisco as part of ProArts Gallery’s Bay Area Currents 2011, curated by Julio César Morales. You can also find Vargas’s work at www.chrisevargas.com.